In New Jersey you never know what weather to expect. It may be warm and sunny one day in April, and snowy the next. With fluctuating temperatures and sudden rain or snowfall, residents of New Jersey must be prepared for any weather change. A metal roof is ideal for New Jersey buildings. Able to withstand high winds, torrential rains and heavy snow or ice, this roofing material can be paired with contemporary or traditional home designs as well as office buildings or manufacturing plants. Most of our products come with a 30 to 50 year warranty. And whether in Atlantic City, Edison or Newark, or where ever you are in New Jersey our company will deliver your order to your work site. Choose from a variety of styles and colors to complement your architectural design. Visit our price list for more information. 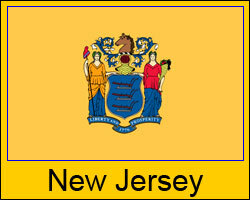 These prices are valid for all cities and towns in New Jersey. However, some shipping restrictions do apply. Click here for details on shipping to your job site. Looking for metal roofing in New Jersey? Then to go to our design and price center and get prices now! All of our roofing is environmentally friendly. It is constructed using mostly recycled metals, and this metal can also be recycled and repurposed at the end of your roof’s lifespan. Keeping with concern for the environment, it is also energy efficient and may qualify for the Energy Star tax credit. We serve Newark, Jersey City, Paterson, Elizabeth, Edison and every New Jersey town and community in between. 30 to 50 year manufacturer’s warranty on most products. Fifty percent lighter than asphalt shingles. Can withstand winds up to 120 mph. Install your metal roof right over the top of an existing asphalt shingle roof. No tear-off, and add an extra layer of insulation to your new roof. Customer service and pricing available from 8:00 am to 5:00 pm MST Monday – Friday.